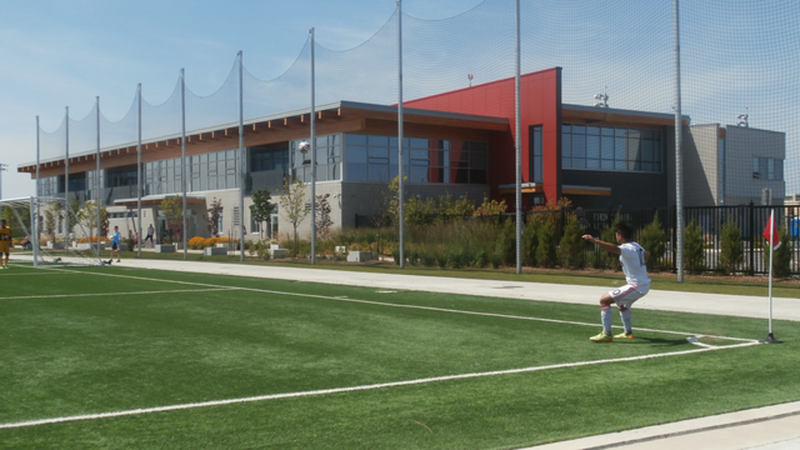 Toronto FC Academy remains on track for an undefeated season following a 7-1 win over Durham United Sunday at Downsview Park. The Young Reds are undefeated in eleven games in all competitions and now sit in second place overall with a 6-3-0 record. They have three games in hand over first-place Sigma, which is three points in front. The game Sunday was closer than the lopsided score might suggest. Durham was competitive for long stretches of the game, which was scoreless until the fortieth minute. It was a penalty, largely created by Marcos Nunes' speed down the wing, that broke the deadlock. The eighteen-year-old was a handful throughout the contest for the Durham back line and this occasion was no exception. A diagonal ball to the corner of the box gave Nunes a slight sniff of an opportunity. He pounced, and got to the ball just a half-second before keeper Eugene Alves. The ensuing collision was deemed a penalty. League leading scorer Molham Babouli got the honours - and he caught the keeper guessing left - but it was Nunes' speed that caused the goal. It opened the floodgates for a wild five minute stretch by TFCA. Nunes was back at it again moments later. Another run down the right flank caused Alves to go well off his line. After some confusion, the ball popped to Anthony Osorio, who nearly walked it into the empty net for a 2-0 lead in the forty-second. Luca Uccello played a give-and-go with Osorio a minute later, before blasting it home with a bullet from eighteen yards. The Young Reds weren't done. Babouli would get his brace two minutes later, when he ran onto a ball over the top from Dylan Sacramento. Arriving just before Alves, Babouli managed to dribble by the keeper and slide home on an empty net. Four goals in five minutes put the result well out of reach for Durham, but to their credit they came out determined to play in the second half. Not that TFCA didn't. Young Reds head coach Michael Stefano has stressed all year that TFCA will not change its approach to a game based on the score. Although winning is an important component of his approach, it's only one part of the coaching philosophy. He wants to produce players that go onto higher levels of the game. The second half performance by TFCA would reflect the benefits of Stefano's philosophy. Sacramento got the first goal of the half after a long stretch of possession by TFCA. A give-and-go with Babouli was the final play, which lead to Sacramento having a wide open attempt from thirteen yards. It was 5-0 in the forty-eighth. The sixth goal came off a nice header from a corner. TFCA defender Quante Abbott-Hill-Smith came up from the back to get his head to it first. Taylor Lord got Durham a goal back with a beautiful twenty-yard run and finish. He managed to direct it past a diving keeper using the outside of his foot, while falling away from the play, in the sixty-fifth minute. It would stay that way until nearly the last touch of the game. It was arguably the game's best player, Nunes, who would fittingly end the scoring when he got in behind a tired Durham back line to score on a breakaway to make it 7-1 in stoppage time.